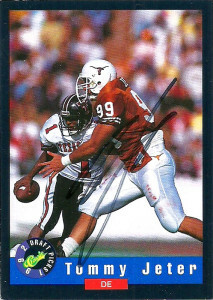 Tommy Jeter played for the Texas Longhorns during the waning days of the Southwestern Conference, (which consisted at that point of a bunch of teams from Texas after Arkansas left). 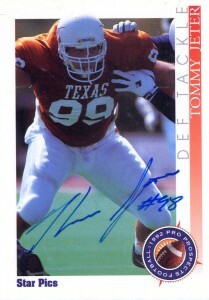 He’d be drafted in the 3rd round by the Philadelphia Eagles, where I’d get his autograph in West Chester in 1995. 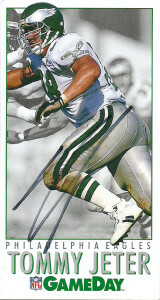 Although he was well sized at 6-5, 285, Jeter would rarely get playing time under Rich Kotite and Ray Rhodes, and injuries took its toll on the young defensive lineman as he spent the greater part of his final season with the Eagles on IR before being released. Jeter would then sign with the Arizona Cardinals and be cut in training camp and then end up with the Panthers before retiring in 1996.